Want to get a European fix without having to cross the Atlantic? Take a trip to Montréal , the largest city in the Quebec Province of Canada. 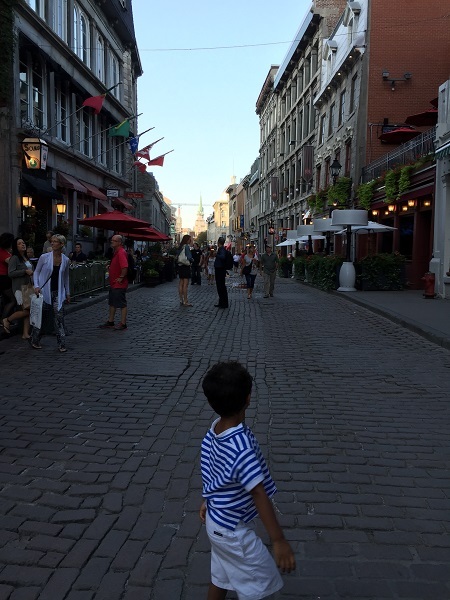 Kids will love the chance to walk the cobblestone streets of historic Old Montréal and interact with French speaking locals. Oh! and don’t forget to try poutine, the iconic Canadian dish of french fries and cheese curds topped with a gravy which is an integral part of any Quebec experience. 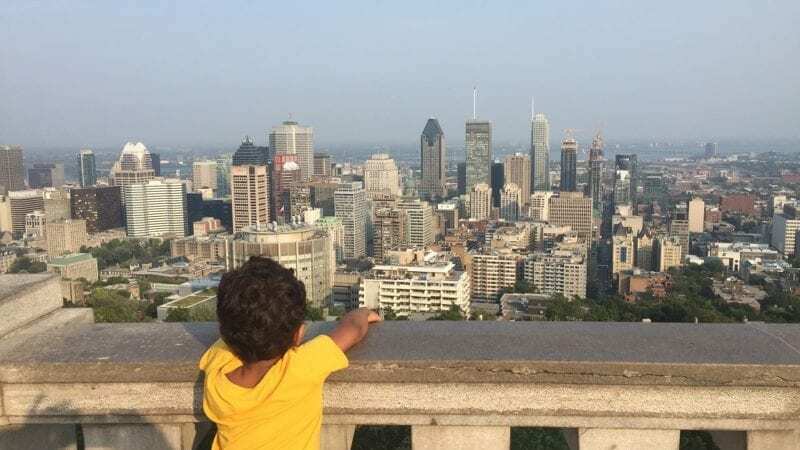 Since we relocated to the Capital Region of New York, Montréal, which is under a four a drive, has been on my radar as our next family vacation spot. It is a city with a wonderful mix of urban experiences and old world charm. The presence of a large student body from four universities also contributes to the city’s vibrant atmosphere. In addition to its French roots, Montréal is also culturally diverse with an immigrant population from all over the world. 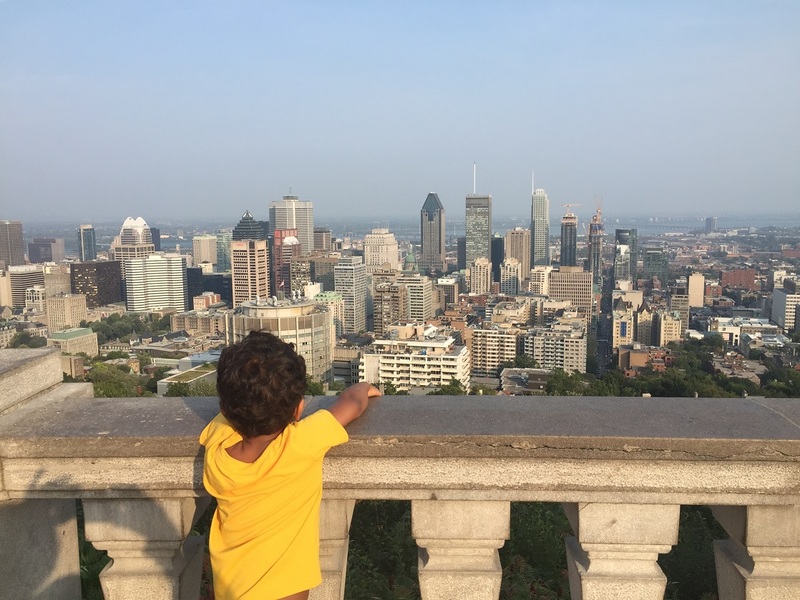 On a recent weekend getaway with our three year old son and infant daughter, we got a flavor of what Montréal can offer to families. 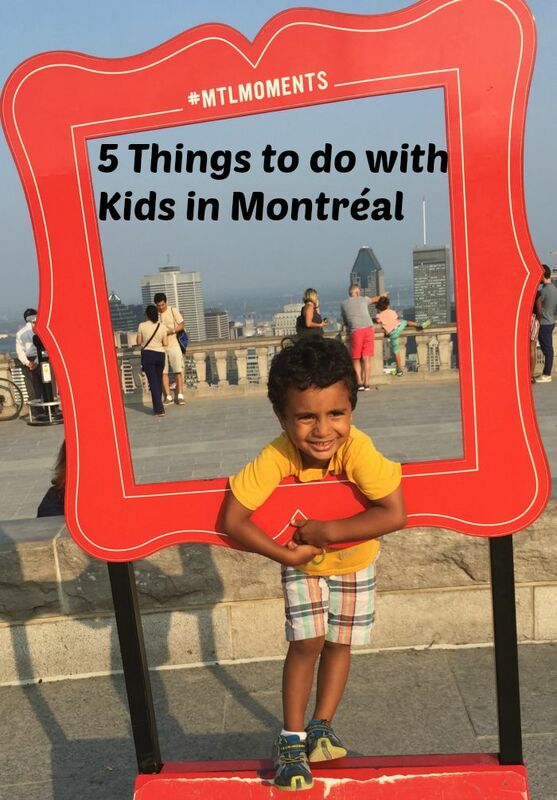 Here are our top finds for what to do in Montréal with kids. With a beautiful view overlooking the St. Lawrence River and the old port, this historic neighborhood is a must see on a visit to Montréal. We were glad that we gave ourselves a few hours to leisurely walk along the cobblestone streets, window shop at souvenir stores and get snacks at outdoor cafes. The beautiful floral displays at the city square make a great backdrop for photos. Marché Bonsecours (the city’s old agricultural market place), City Hall and the Notre Dame Basilica are a few of the architectural highlights during our walking tour. We also loved browsing art along the narrow passages of pedestrian-only “Artists’ Row.” A very kind balloon artist conjured interesting creations for as little as C$1, to our kids’ delight. 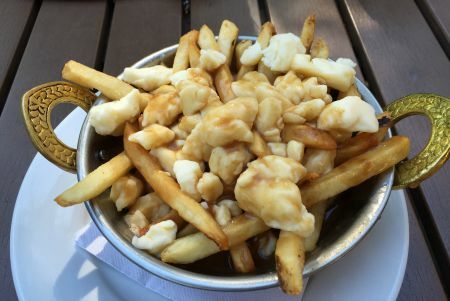 There are plenty of dining options for different flavors of Montréal specialties such as poutine (french fries with cheese curd and gravy) and smoked meat. It was easy to find restaurants where we could walk in without advanced planning. Montreal Poutine and Xavier Artisan (for homemade gelato) were two foodie finds that deserve to be recommended. Visiting local markets is one of our favorite ways to immerse in the food culture of a new city. 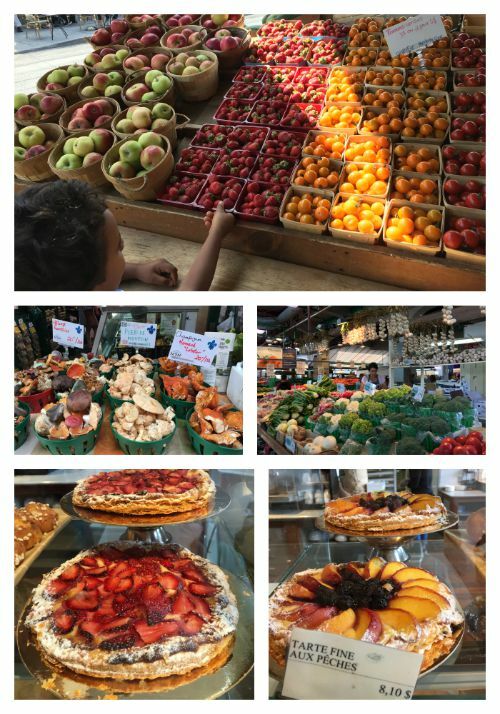 Located in the Little Italy area of Montréal, it is one of the oldest and biggest markets showcasing a large variety from fresh produce to prepared foods. Our son loved strolling through the stalls and sampling items such as cheese and nuts. Première Moisson bakery located across the main market place was a great find for bakery items, sandwiches and desserts. Food is a huge component of experiencing the multi-cultural aspect of any city. We visited the ethnic neighborhoods of Little Italy and Chinatown, checked out local grocery stores and picked up a few specialty snacks. Montréal also boasts of restaurants of many different cuisines. We discovered Cantinho de Lisboa, an eat-in/take-out type Portuguese restaurant and food market in the heart of Old Montreal serving treats reminiscent of our visit to Portugal a few years ago. Chatting with the local server, we learned that there was a significant population of Portuguese immigrants in the city and got recommendations for more restaurants to try on future visits. If there is any ethnic food that you’re craving, chances are high that Montréal will have a few authentic offerings for you. Having just understood the concept of national flags, our son loved seeing the different flags displayed at various restaurants and other administrative buildings, especially in Old Montréal. The largest city park that includes the mountain Mount Royal should be on every family’s itinerary. The open space was great for my energetic son to run about after a few hours in the car. The walk from the base of the parking lot to the visitor center, Chalet du Mont Royal is about a 20-minute walk even my three year old could do with ease. Going either early in the morning or late evening will be very pleasant to experience the panoramic views of the city from its highest point. The Chalet du Mont Royal is a spacious building with a small gift shop, a few vending machines and microwave facilities. Don’t forget to admire the artwork based on the history of Montréal in its interior walls. A few more minutes’ walk past the visitor center will lead you the giant metallic cross at Mount Royal, a monument on top of the northeastern peak of the mountain. It is symbolic of the first cross erected in the 17th century by the city’s founder as a vow to The Virgin Mary for relief from a disastrous flood. Built for the 1976 Summer Olympics, the Olympic Park has become a multi-faceted tourist attraction. 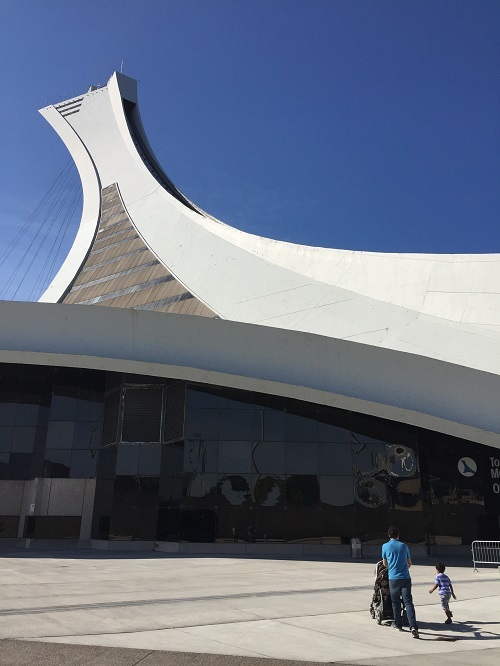 You can take guided tours of the Olympic Stadium and also visit the leaning Montréal Tower. Completed in 1987 more than a decade after the games were held, Tower Observatory is now identified as part of this complex. It is the tallest inclined structure in the world with a two minute ride to the top in glass-encased funicular. The ride was a first of its kind experience for my son and also hassle free for my infant in her stroller. Once we got to the top we took our time taking in the bird’s eye the view of the city and the surrounding rivers. With a 360 degree view, it was a different perspective from the open air view of Mount Royal. Unless you really want to experience the funicular I would recommend skipping the visit to the top which has no other activities besides taking in the view. Instead walking around the park and experiencing this architectural marvel from the ground will be easier on your wallet as well as the kids’ patience. Having just spent the weekend, we have barely scratched the surface of this cosmopolitan city. Visiting the Biodome, shopping on St. Catherine’s Street and exploring the underground city are on our agenda for the next visit. Do you have any hidden gems that one must see in Montréal? Anuja De Silva is a full time working mom and aspiring writer. She is learning to integrate, family, career and travel along with her love for fashion and party planning. She lives in Albany, New York with her husband, son and daughter. She loves to explore new cultures and inspire other working moms through her adventures.